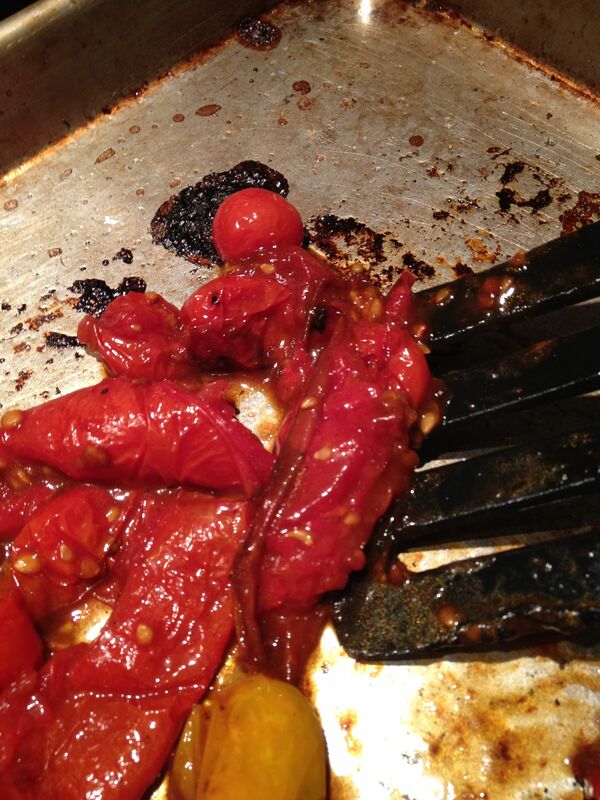 While I’ve made several batches of my Aunt Jeanne’s Baked Stuffed Tomatoes (hoping the ground beef/onions/tomato dish would help wean me off a recently-acquired addiction to SmashBurgers), no one else in the family was crazy about the texture and/or concept of a baked tomato. 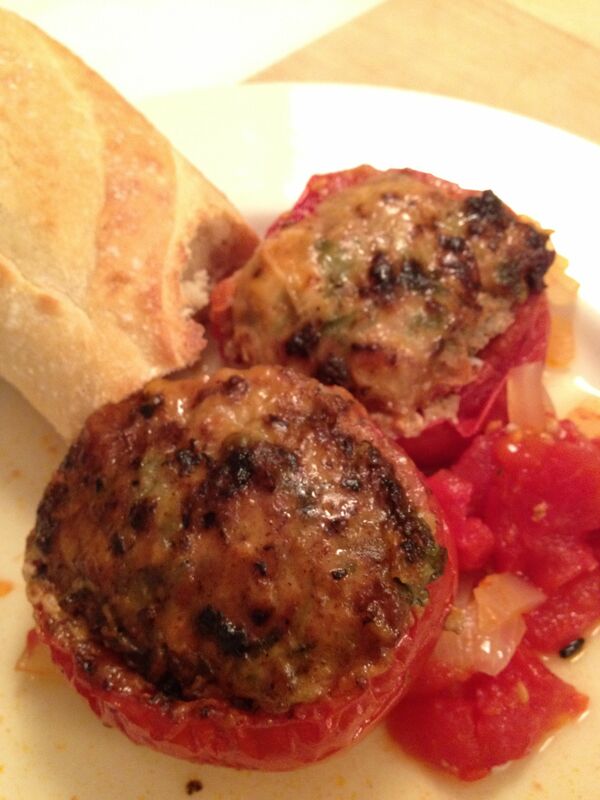 Auntie Jeanne’s Stuffed Tomatoes – an easy and delicious meal-in-one, if you like baked tomatoes. 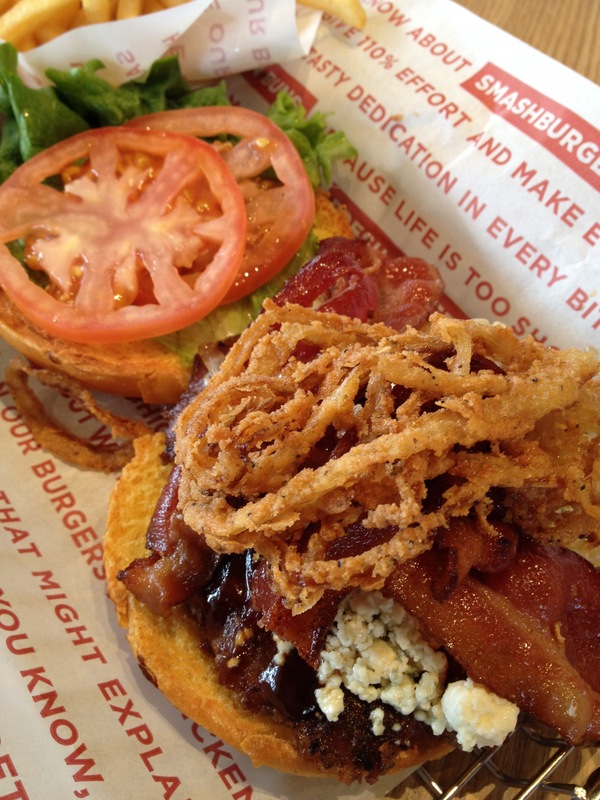 SmashBurger’s “New Jersey” Burger with tomatoes — oh, and bacon, crispy onions and blue cheese (and my personal substitution of BBQ sauce instead of mayo to save a few calories). We’ve maxed out on Caprese salads with mozzarella and basil, tomato and corn salsa and tomatoes with sherry vinegar and sea salt. 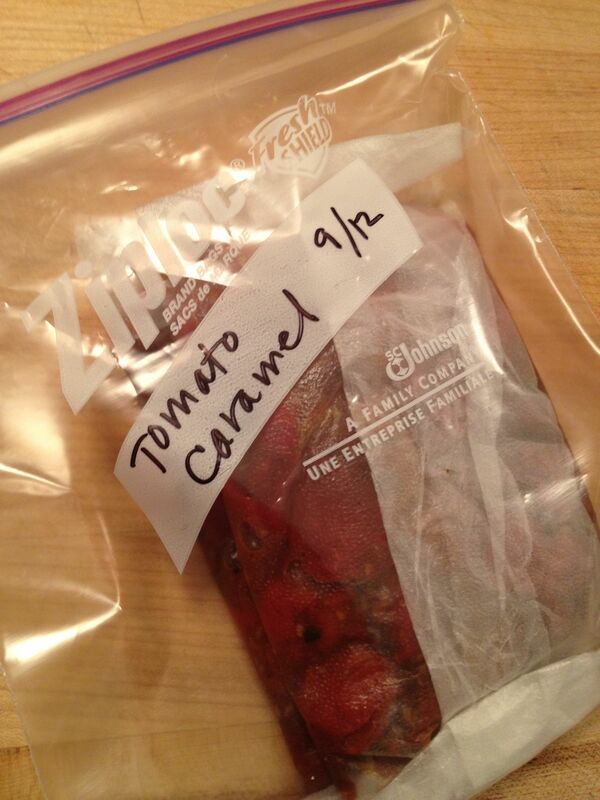 So, with tomatoes multiplying on our counter and their time running out, I’ve ramped up production of one of my secret cooking ingredients: Tomato Caramel. 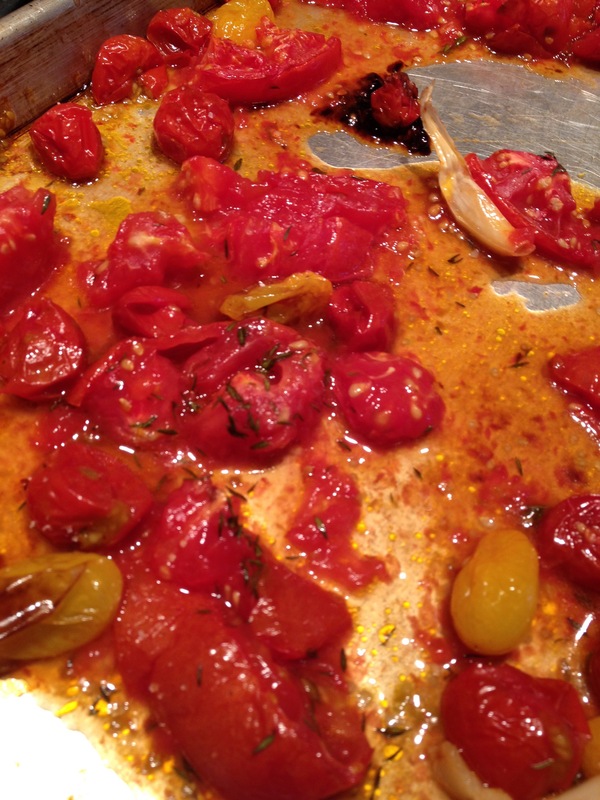 Cooked at high heat with a little olive oil, salt and flavorings such as garlic cloves or fresh thyme sprigs, the tomatoes ooze and burst and caramelize right on the baking sheet. 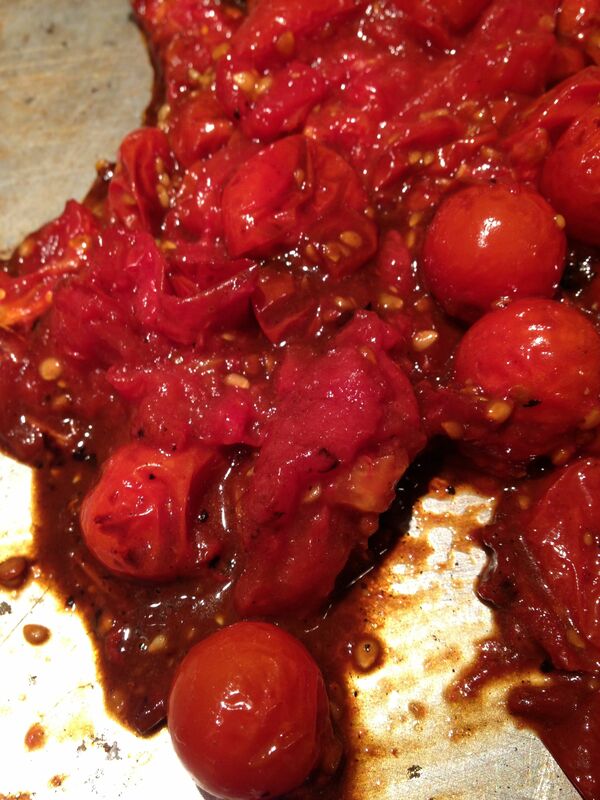 Scrape up the tomatoes and all the browned bits from the pan and voilà – Tomato Caramel. 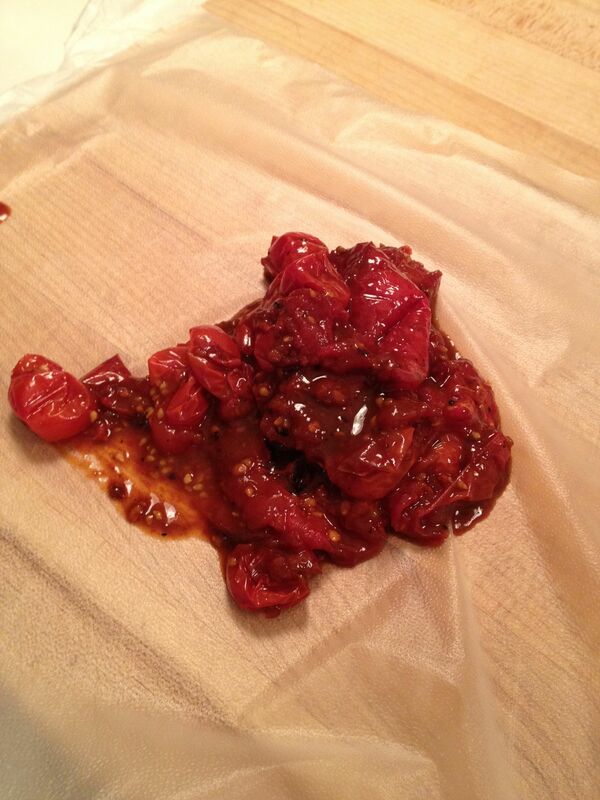 More than just a simple way to preserve tomatoes, Tomato Caramel is also the world’s easiest tomato sauce, a tasty topper for ricotta or goat cheese-smeared baguette slices, and great way to add flavor and complexity to spaghetti sauce (jarred or homemade), taco filling, soups, chili, lasagna, etc. 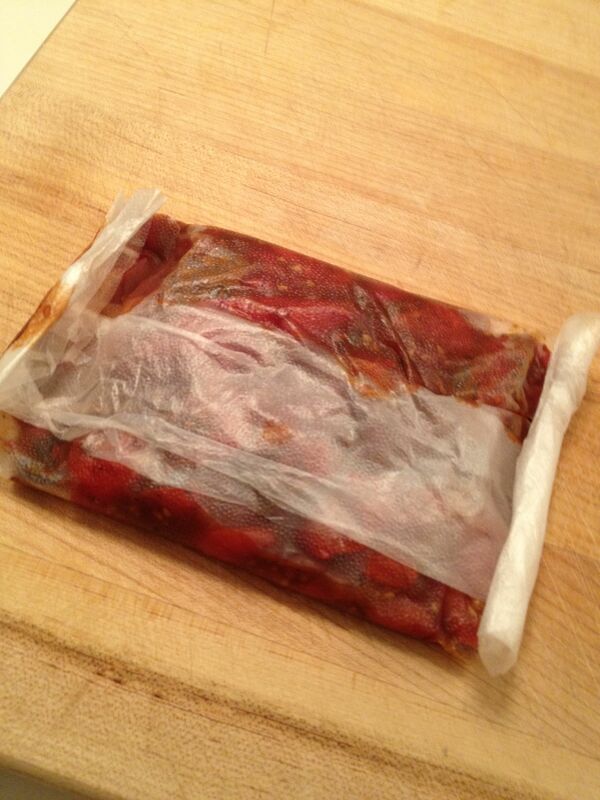 I freeze the “caramel” in little packets, and add them to any dish that needs “a little something”. 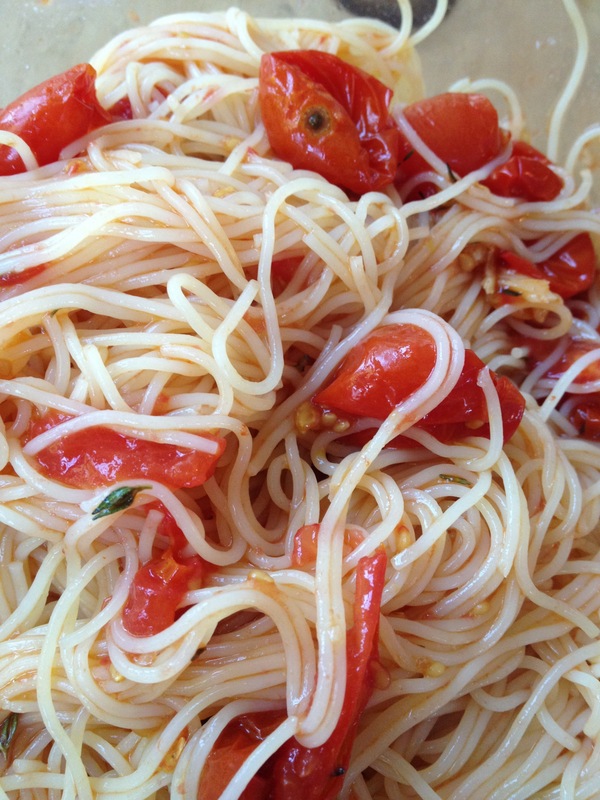 This entry was posted in Gardening, Pasta, Sauces, Vegetables and tagged easy tomato sauce, gardening, oven-roasted tomatoes, preserving tomatoes, SmashBurger, tomato jam, tomato sauce, tomatoes by subeeskitchen. Bookmark the permalink. I have missed you, Subee’s Kitchen !! This looks awesome !! 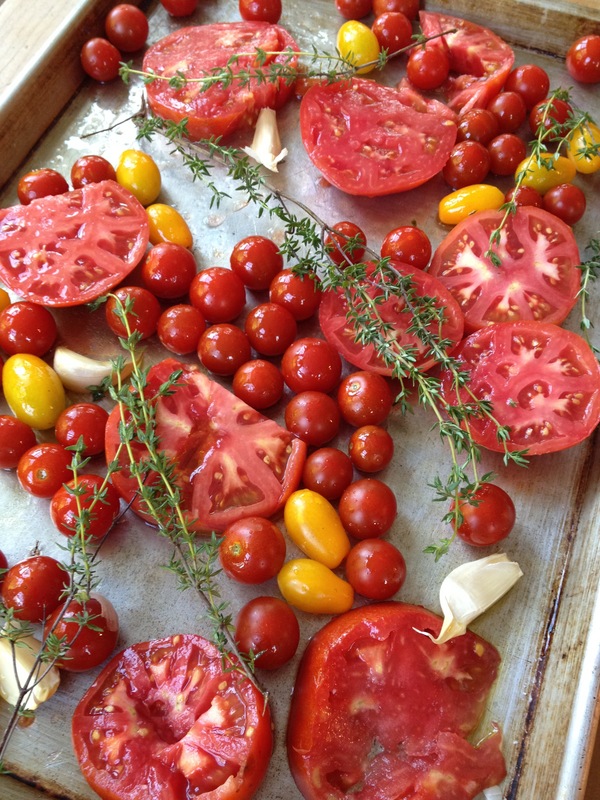 Unfortunately, I didn’t grow any tomatoes AT ALL this year, but I’m going to try it anyway !! Of course, my freezer is packed with chicken stock (I blame you !) 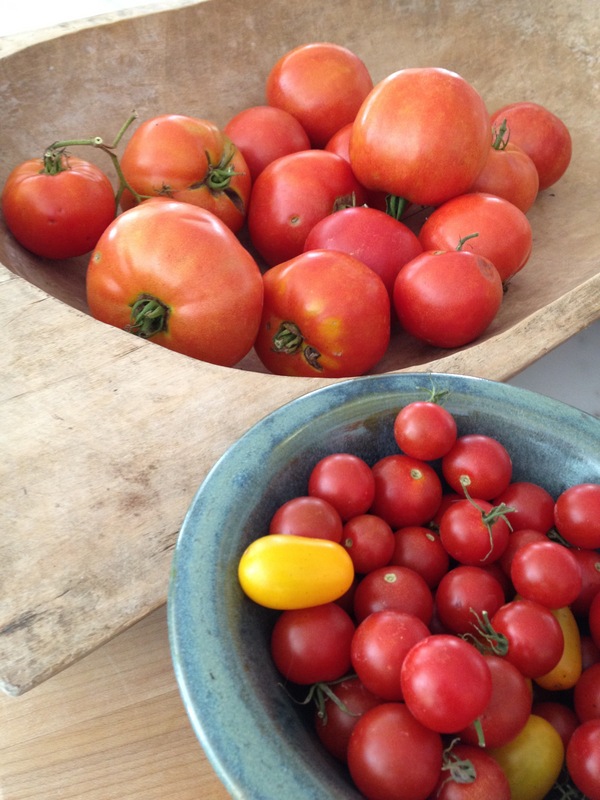 🙂 that I’ve still done nothing with after all that !, so there’s no way I can have leftovers of the tomatoes (well, unless I decide I can do without ice or you post a yummy soup recipe that calls for chicken stock !). By the way, wanted to let you know, you’ve got a fan in Zurich !! Oh, and I’m totally laughing at your BBQ sauce/mayo switch out on the calorie save !!! 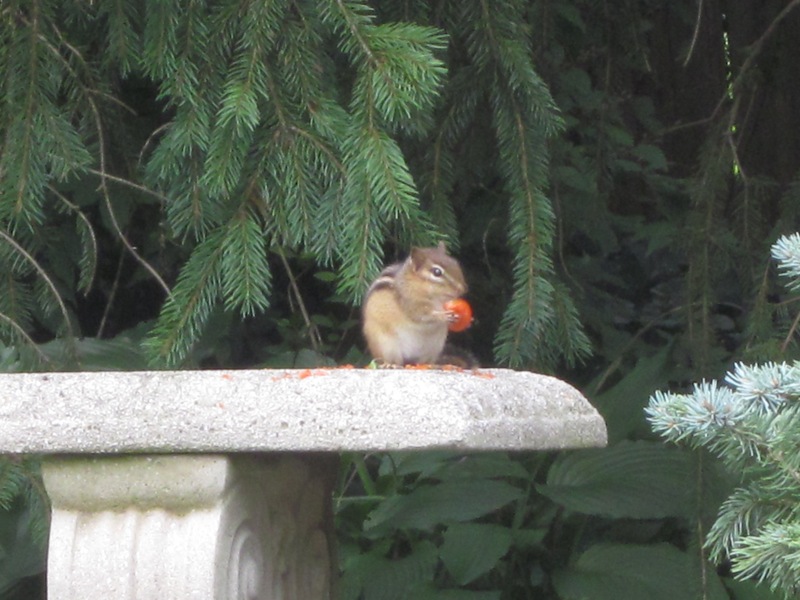 Ooh, last thing – is that chipmunk discarding the seeds ??? What is happening there ?! Hang on, Kelly – more soups and chicken stock uses coming up! Quand va-t-on dejeuner ensemble chez smash burger ? Jamais essaye encore. Bientot – soupes et Smash !